I had wanted to fill a huge void on my wall, above my computer, for some time. I hunted around for some geeky posters, like one showing the structure of the internet or the java class library, but they were either impossible to get, expensive, or too small. 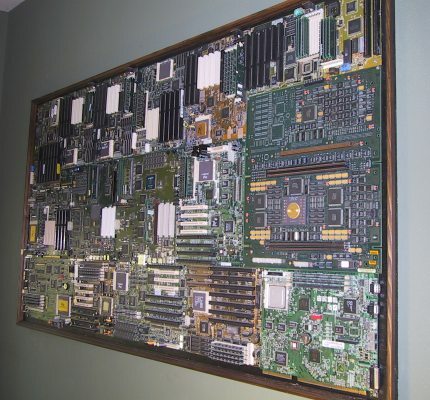 A few months earlier, I had seen a large prototype motherboard mounted on a wall at my university. It looked awesome and I figured I could duplicate the look and make a jazzy art piece for my room. 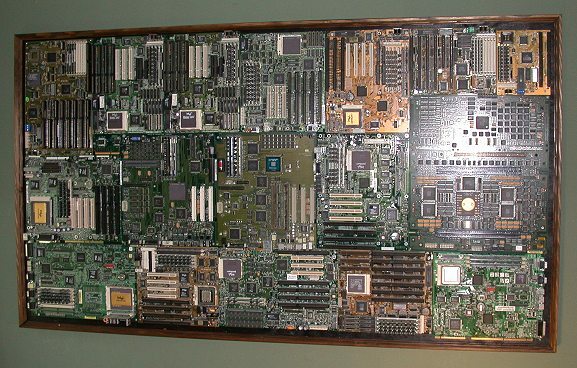 I wanted to fill a 5' x 3' area, so I figured I needed something like 20 motherboards, assuming they fit together well. 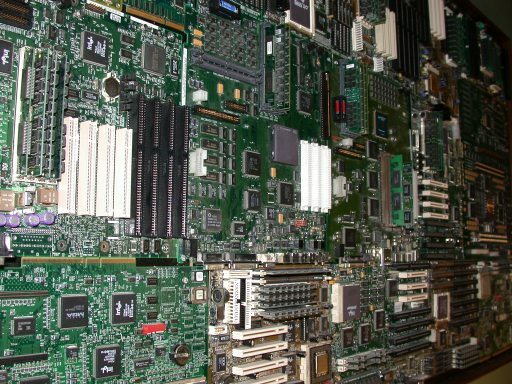 Now motherboards aren't cheap, especially if you want processors and RAM on them. However, thanks to the wonders of eBay, I bought 34 motherboards for about $1.55 each, and that included shipping costs! As they started to trickle in, I realized I had a great assortment of colors, types, shapes, and sizes. Just over half the boards came with processors and RAM. The trickiest part of the whole project was figuring out how to place them nicely. They were all different sizes and shapes, so to get them to snuggly interlock together, without gaps, was quite a challenge. Trust me, there was a lot of different combinations to work with, but I eventually found a good placement that fit my target size of 5' x 3'. The design was mounted onto a piece of 1/2" plywood, which I painted black so it wasn't obvious where there were little gaps. I also framed with some wood trim, which I stained. It must have weighed something like 60 pounds and couldn't be mounted easily. It had to be screwed directly into the wall studs, making it a permanent addition to my room. What you won't get from any of the pictures is the size of this piece. This thing is just under 6 foot diagonally, about the size of an average human. That's a lot of surface area! If you stand a few feet from it, it fills your entire vision. The pictures also don't do justice to the detail of all the circuitry and ICs, let alone the subtle color highlights from components like neon colored batteries. When ever people see it, they think it looks like a satellite picture of manhattan because it is so rich in detail. 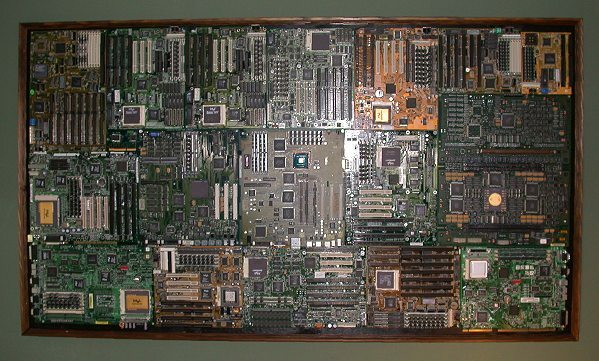 In the end I had used 17 different motherboards in the final layout. 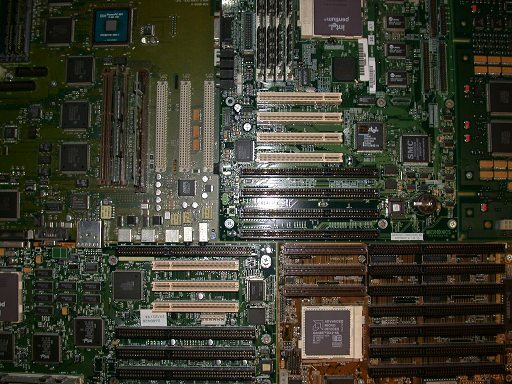 I scavenged processors and RAM from unused ones to populate the selected boards. All in all, the final design included 60 RAM DIMMs, which has a collective total memory of about 500MB. The collective processor speed is probably nearing 1.5 Ghz, although that's a rather silly statistic considering the variety of technologies.